Nestle is expanding its hot snacks range with the launch of new Snack Bites and Breakfast Bites under the Hot Pockets brand. Hot Pockets are claimed to feature freshly-baked crusts around a blend of premium Hickory Ham, Signature Pepperoni and 100% real cheese. Commenting on the launch, Christopher Brody, marketing manager for Hot Pockets, said: “Today’s millennials aren’t sitting down to a traditional three meals a day, so the lines have become blurry between meals and snacking. Our new HOT POCKETS Snack Bites and Breakfast Bites offer our fans a bite-sized snack version of the hunger curbing power of HOT POCKETS”. 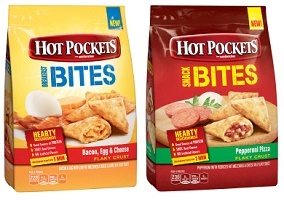 Hot Pockets Snack Bites come in Pepperoni Pizza, Hickory Ham & Cheddar, Four Cheese Pizza and Cheesy Beef Nacho varieties, while Hot Pockets Breakfast Bites go on sale in the varities Bacon Egg & Cheese, Ham Egg & Cheese and Sausage Egg & cheese. The suggested retail price is $5.00 for two 9-ounce packs.